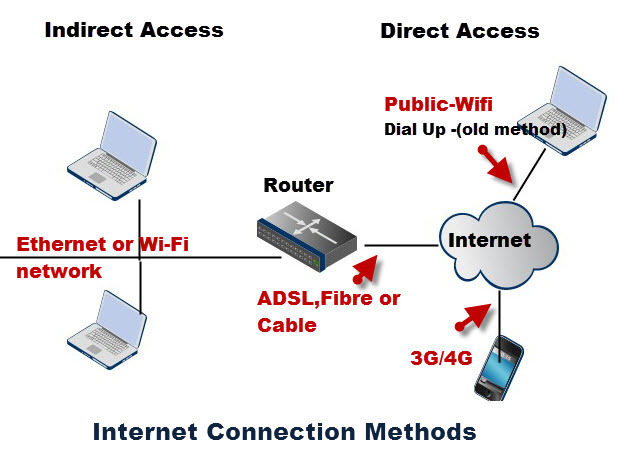 There are several ways or methods of connecting to the Internet. There are two access methods direct and Indirect and these can be either fixed or mobile. This is most common method used in home and office networks. The device e.g. computer connects to a network using Ethernet or WiFi and the network connects to the Internet using ADSL, cable or fibre. This is most common method used when traveling. The device e.g. smart phone connects directly to the Internet using 3G/4G mobile networks or public Wi-Fi. 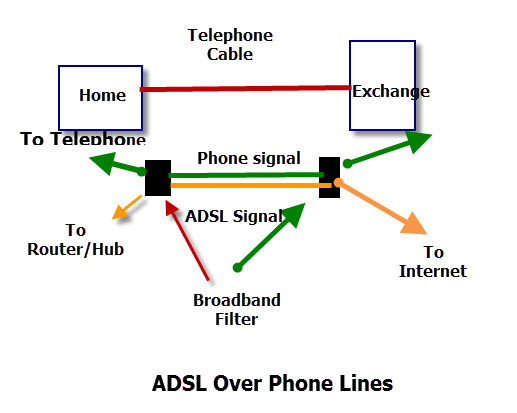 ADSL over traditional Phone Lines (most common). When travelling away from the fixed location mobile access is used. Note 1: Broadband is a generic term and in communications. It refers to a channel with transmission rates above 256kbits/sec but typically (UK) above 4Mbits/s (for ADSL). Wi-Fi is classed as broadband. Note 2: Although this article mentions UK providers as I am UK based the same access mechanisms are used in North America and other countries. This is probably the most common way to connect to the Internet for home and small business users. Connection to the Internet for home/home offices is usually accomplished with ADSL (Asymmetric digital subscriber line) which uses the existing telephone cabling infrastructure. 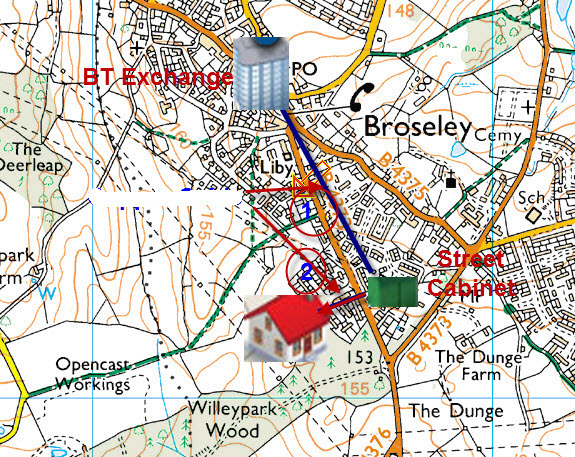 In the UK BT (British Telecom) provide the familiar telephone connection to most homes, and these same telephone wires are used to provide broadband internet using ADSL technology. The broadband connection and the standard phone service share the same telephone lines without interfering with each other. It is the job of the broadband filter to split the phone signal from the broadband signal. A filter must be installed on a telephone extension that has a telephone connected. The Internet Signal from the filter is feed into a broadband router/Hub which can be used to form a home network. The same access policy has been adopted in most countries. Broadband speeds quoted by providers are the maximum that is possible over an ADSL connection, and the speed you actually get depends mainly on how far you are from the local telephone exchange. Cable connects you to the Internet through a coaxial cable usually using the same line as your TV service. Cable connections offer very high connection speeds, but the connection may be shared with other users. This means that you can experience much slower speeds due to congestion. In the UK Virgin Media are the only suppliers of cable broadband which they market as fibre broadband. However it is not fibre all the way to the home but fibre to the cabinet, as the last part of the connection utilises the old coaxial cable connections. Despite this download speeds of up to 152Mbs are being offered on broadband packages. This is currently being rolled out in the UK by BT, and offers download speeds of 76Mbit/s. Fibre to the home is the fastest and means that the connection from the home to the exchange is all fibre. This service require new hardware. See Preparing for install . Fibre to the cabinet is slower than fibre to the home as the entire connection isn’t fibre but only the connection from the exchange to the street cabinet. Just as with ADSL broadband other operators have access to the BT fibre network and will offer fibre services that use the BT infrastructure. Virgin Media are the only other UK provider of fibre connections. Although probably not as common as ADSL this is the best way to connect to the Internet if it is available in your area. 3G and 4G networks are provided by mobile phone operators. 3G mobile phone networks are the most common, and have the widest coverage area,whereas the newer 4G networks are less common with restricted coverage area. Mobile Internet services are available on a contract or pay as you go basis. 3G mobile networks were designed mainly for phone calls (voice) but with improved internet access speeds when compared to the earlier 2G standard. A 3G mobile phone can make voice calls, and also access the Internet using a data channel. Mobile phone operators usually have two separate plans – standard voice plans and a data plan. Data plans tend to have restricted download limits and exceeding them can be expensive. Internet access speeds will vary depending on technology and location, but you can expect between 200kbps and 7.2Mbps. – This is currently in the initial phases of being rolled out in the UK. It uses HSPA+ access mechanism with speeds of up to 168 Mbit/s in the downlink and 22 Mbit/s in the uplink. 4G networks are expected eventually to offer download speeds of up to 1Gbits/s (LTE advanced). 4G mobile networks are designed primary for carrying data using the IP protocol. Capability is already built into Google Nexus 7 (mobile data model) and the Nexus 4 mobile phone. Due to the excellent speed potential 4G networks may replace fixed line networks in some rural areas. In developing countries and new build areas it could become the main connection type. The wireless technology used is the same as is used in home wireless networking, and hence if you have laptop/pda that is equipped for connection to a home or office wireless network then it will also work on a public wireless network. The problem with this is that it is only available only in limited areas usually public areas like airports, train stations etc, and it poses a very strong security risks. These types of access date back to the early days of the Internet, and may no longer be provided by most ISPs. Basic Internet browsing and email. Not suitable if regularly downloading or uploading large files like music, video or pictures. With the rapid adoption of ADSL dial up access is often only used as a secondary/ backup Internet access method for mobile users. You should be vary wary of this connection type due to Rogue Internet Dialler software. This was the main method for high speed Internet access prior to ADSL and is now no longer used. It is similar to dial-up, ISDN establishes a connection to your service provider when you access the Internet. However, ISDN circuits are 64-128K and fully digital. ISDN is not easy to install and troubleshoot and requires you to have an ISDN box installed by your telephone company. line you can also use a normal telephone line at the same time . This means you can access the Internet as well as talking on the telephone. Lets you talk and surf simultaneously. Basic Internet browsing and email and connection sharing. Not suitable if regularly downloading or uploading very large files like music, video or pictures. Q- What is the difference between ADSL and DSL? A- ADSL stands for Asynchronous Digital Subscriber Line and DSL stands for Digital Subscriber Line. Because most people download more data than they upload ADSL uses different upload and download speeds. There is also SDSL (Synchronous Digital Subscriber Line) which offers the same upload and download speeds. Q What is a always on connection? A- In the early days if the Internet dial up access using modems was the only way of a connecting to the Internet. With Dial up access your connection was only on when you dialled up the connection and was off when you disconnected. ADSL and Fibre technologies are always connected, and you don’t need to manually connect. 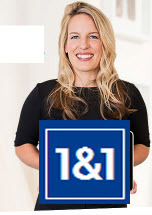 Q- Is an ISDN an always on connection. A- No it is a dial up connection. Q- Can ISDN and my telephone share the same telephone line? A_ Yes . They can both use the same telephone line and you can talk on the line as well as connecting to the Internet at the same time. Q- Is 3G always on? Internet and Networking Components– Internet and Networking Components for connecting to the Internet. Hi Steve, Great site!! I have a question that maybe you can assist me with. Thanks for helping me understand that the Fibre connection is the fastest type of connection for residential homes. With that in mind, I think I might have to look for an internet provider that offers this kind of connection. I actually need this fast connection also because my husband and I need to video call each other every day without problems since he is away for a year. Thanks! I never knew that there are two internet access methods. My dad owns a small coffee shop in our hometown and is looking for business internet options. Thanks for the information on connection and access methods.